Australians held on to a well deserved win over Wales in their last group game as the game ended 15-6 but it was alot tighter than the score suggest. Both teams were always in the game and there was not much between the two apart from 5-10 minutes of resilient defense by Australia to hold on to their lead. 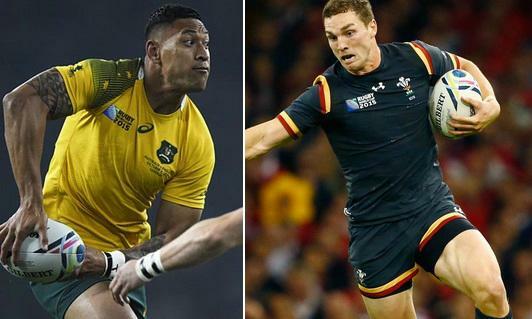 Australia will play Scotland in the quarter finals while Wales will take on South Africa. In the important pool a clash between two already qualified teams Australia and Wales, Wallabies lead the Welsh side 9-6 at the break after a very competitive first half. After the break game was even more close and both teams were in the game throughout the game. Australia produced one of the best defensive performance of the world cup when they were two men down and managed to keep Wales at bay and won the game 15-6. For the winner of this game the quarter final tie against Scotland was kind of the only incentive as both teams had already qualified. It was a wonderful game tonight where Australia had the upper hand in first half as they lead 9-6 but Wales comeback stronger in second half but was not enough to complete the turn around as Australia were impeccable in defence. A Well deserved win for Australia by 15-6. The match will be played on Saturday at 16:45 uk time at the Twickhenham Stadium London and ITV will have live coverage in the UK while FoxSports will broadcast the game live in Australia. Here is a short match preview and team news. Australia vs Wales Preview: On paper Wallabies are much better side than Wales and they have won all of their last 10 internationals against Wales but the kind of results this world cup is throwing up you can never predict a game of this magnitude. Both teams are coming into this game having already booked their place in the quarter finals but Wales lost number of key players through injury which makes Australia favourites going into the game. Although Wallabies have won each and every of the last 10 matches between the two sides but last 9 meetings between ended in Australian narrow wins within 9 points difference with average 4.4 margin win margin. Which goes to show Wales are not too far away from Australian quality on the field. It all sets up a great rugby viewing for both fans and the neutrals. Australia announced the lineup to face Wales on Saturday and they made 3 changes while Wales announced the lineup with 6 changes from their last game and George North set to start outside-centre. Israel Folau of Australia is a doubt going into the game as he suffered ankle injury against England which means Kurtley Beale is likely to replace him in the lineup. While Wales are stricken with injuries before and during the tournament with George North and Gareth Anscombe to start in unusual roles. As much as I dislike the UK commentators, big props to totalSportek for bringing us the games LIVE.